Bassist Barry Guy has stepped away from his London Jazz Composers Orchestra to perform in small group settings and perform solo. His associations with the old and the new of the avant-garde have him collaborating with among many, Evan Parker and Mats Gustafsson. His solo recordings for bass, date back to 1976 with Statements V-XI For Double Bass & Violone, Assist (1985), and Fizzles (1993). His 1991 duets with bassist Phillips on this same Maya Records is well worth seeking out. On Symmetries he displays a total command of his instrument, working the top and bottom ends to great effect. Guy challenges his listeners with inventive methods of approaching sound and playing. This recording is almost all improvised with the exception of two Charles Mingus tracks, Weird Nightmare and Eclipse and a couple others that have a distinct song form. The remaining music follows a free path of tones, pitches and ideas. Guy follows up on his last solo record with a series of seven Fizzles or short, intense improvisations. These, while tending toward the extremes in music making, are instantly satisfying and digestible. His longer pieces require a bit more patience and repeated listening. On several, Fizzles and Bichrome Terrors, he emulates his fellow British Isle improviser Derek Bailey with eccentric technique and noisy touch. Other places he opts for an almost classical approach playing beautiful arco lines. His multi-track take on Mingus' Weird is haunting and majestic. 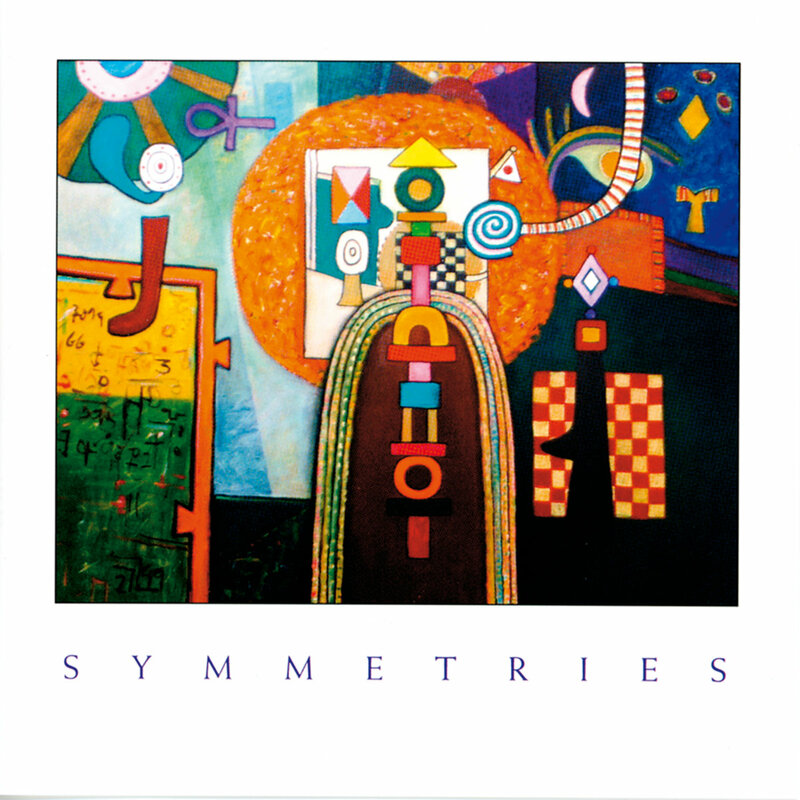 Few recordings come close to Symmetries in terms of capturing the totality of Barry Guy's sound. This solo album pairs the double bassist and an Irish concert hall whose decay is a few tenths of a second short of being dry, and the results are stunning. Engineer Nicholas Parker strikes a fine balance between direct and ambient sounds to capture the vast array of timbres Guy milks from Roger Dawson’s 1997 instrument. Spanning "seven fizzles", a bracing series of short improvised outbursts packed with jarring effects and haunting readings of Charles Mingus' Weird Nightmare and Eclipse, employing overdubbed harmonics, Guy packs each track with truly dazzling extended techniques. On that level, Symmetries is a virtual master class. Still, Guy's program is not just impeccably recorded gymnastics, but a compelling impassioned statement. Granted, the best entry points into Guy's emotional bearing are pieces unadorned by extended techniques, like soft fire a relatively straight-up pizzicato solo that has the same heart-on-sleeve quality as Guy's potentially perennial Odyssey which is reprised here as well. On the latter piece, Guy subjects the pastoral lyricism common to both pieces to a process that can be likened to a particle accelerator. Fragments splay and textures collide; yet Guy maintains an emotional continuity that, in the end, intensifies the piece much more than any pyrotechnics. Without obvious thematic mooring, Guy's methods may initially seem merely turbulent. However, the emotional continuity of even abstract constructions like whether or not why not and I have crossed by the grace of the boatman becomes plain when heard in the context of the entire album. It is in this regard that the liberally interpreted Mingus pieces have a particular resonance, as he remains a paradigm of marshalling the most explosive aspects of humanity through compositional means. Guy achieves something akin to the larger-than-life aspects of Mingus' music through more freely improvised methods on Symmetries, a far more important accomplishment than clean sound and polished technique. While group playing is central to improvised music, solo playing has always afforded a particularly fascinating focus on the musical thinking of one individual. Not every player can function comfortably in that intense gaze, but one who never fails to provide music of great worth is double bass player Barry Guy. His new CD Symmetries (Maya MCD0201) was recorded, with complete clarity of sound, at the New Hall at Ballytobin, near Callan in County Kilkenny. It is the most complete example of bass playing you could hope to hear. There has always been a strong lyrical element to Guy’s playing, threaded through his multidimensional, energy-concentrated, cleaved and reconnected soundscape (on Harmos, composed for the London Jazz Composers Orchestra, and After the Rain, composed for the London Sinfonia, for example) and it it is an element often to the fore on this recording. This lyricism is not however the sort that pours forth, with ease, in rhetorical flourishes (as featured on many ECM releases), but is always the result of struggle and effort; a constant questioning, a refusal of the easy path. It is a decisive transcendence; a lick of red paint on black impasto. It is the balance between forces and its unforced balance that makes this such a profound and impressive recording. Es ist einerseits die souveräne, nie in Effekthascherei abdriftende Instrumentalistik, andererseits die zwingende Ereignishaftigkeit seiner musikalischen Fantasie, die diesen bestechenden Bassisten, Improvisator & Komponisten auszeichnet. Außergewöhnlich ist zu dem, mit welchem Gespür für Spannungsinhalte Guy organisch Erfahrungen mit klassischer Musik (Alte wie Neue) und Erforschungen im Bereich der freien Improvisation zu einem Individualstil zusammenführen kann. Guy ist zweifellos ein vor keinem Risiko zurückscheuender Spontanerfinder, der die Aggregatzustände seiner Musik bestechend zu variieren weiß. Von aufbrausender Vitalität fast bis zum Stillstand. Hierfür streicht und zupft Guy, jeden Quadratzentimeter seines Instrumentes nützend, flächige Entwicklungen,bei denen sich die Klangmassen in unterschiedlichen Tempi und unterschiedlicher Dichte ineinander wälzen, heraus, und im Gegensatz scharfkantige Mosaike, in denen die Symmetrie der Spannung der Außermittigkeit frönt. An extraordinary guy.